To Make the Streusel: Place all the ingredients for the streusel into a food processor and process for 1 minute until combined. The consistency of this streusel should be pea sized crumb pieces. In a small bowl, set streusel aside and store in the refrigerator until ready to use. To Make the Muffins: In a large bowl, whisk together both flours, sugar, baking powder, and allspice. Stir in the brown sugar and blend well. In a separate bowl, mix together the pumpkin puree, eggs, vegetable broth and vanilla extract. Pour the liquid ingredients over the dry ingredients and whisk together quickly until just combined. The batter does not have to be smooth and will be slightly lumpy. Divide the batter evenly between the 12 muffin cups. Generously sprinkle some streusel mix over each muffin top. 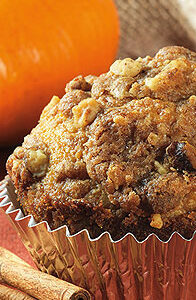 Press the streusel crumbs into the muffins with the back of a spoon. Bake muffins for 20 minutes or until tops are golden brown. To test if muffins are done, insert a toothpick into the center of a muffin. It should come out clean. Cool on rack for 5 minutes and serve warm. Tip: these muffins are best when served warm. They can be frozen for up to 2 months and reheated in oven before serving.